They are hunting for Moroccan-born Younes Abouyaaqoub, now named by Spanish media as the suspected driver. Police say the suspects had been planning more sophisticated attacks. They said blasts on Wednesday at a house in the town of Alcanar deprived plotters of bomb material, so they carried out simpler attacks using vehicles. 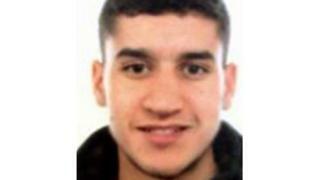 Abouyaaqoub, 22, lived in the town of Ripoll to the north of Barcelona. 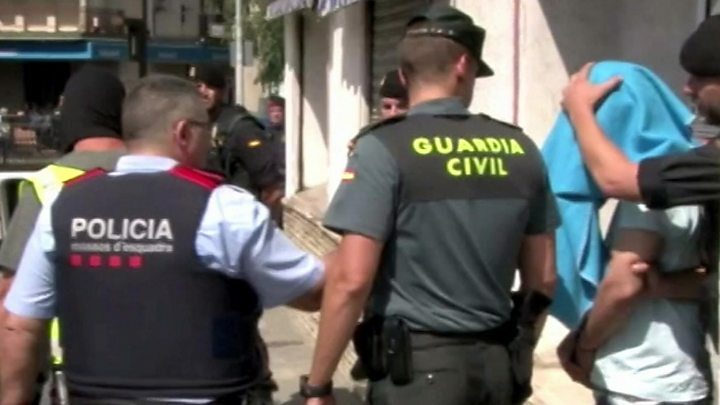 Three people have been arrested in Ripoll and one person in Alcanar. Oukabir had previously been seen as the main suspect – but late on Friday police chief Josep Trapero told local TV that the theory that he was the driver now “had less weight”. El Pais newspaper said there was a growing belief that Abouyaaqoub was the main suspect. Oukabir is suspected of using his brother’s documents to rent the van used in the Barcelona attack and another found hours later in the town of Vic, north of Barcelona, that was intended as a getaway vehicle. In the early hours of Friday police shot dead five attackers, including Oukabir, in Cambrils after the men drove a car into pedestrians, killing one woman and injuring six other people. The attackers’ vehicle overturned and when the men got out they were quickly fired upon by police. One was reportedly brandishing a knife. The men were wearing what appeared to be explosive belts, police said, but these proved to be fake. On Saturday, police said they were carrying out controlled explosions at the Alcanar site. El Mundo says that officials believe a cell of at least a dozen people was operating at the house, which was being used as a bomb factory to carry out attacks with even greater devastation than the Las Ramblas attack. Interior Minister Juan Ignacio Zoido said on Saturday that the cell had been “totally dismantled”. He said that security measures were being increased around the country, particularly at tourist areas, but that the nation’s security alert level would would remain unchanged as there was no information of a possible imminent attack. He said the country was united in pain but also in the fight against terrorism. 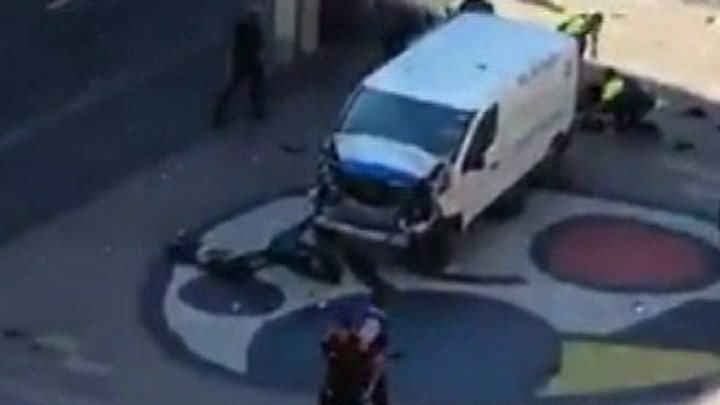 Thursday’s attack occurred when a Fiat van was driven down the pedestrianised Las Ramblas area, killing 13 people and injured scores more. So-called Islamic State (IS) said it had carried out the Las Ramblas attack, though it is not clear whether any of the attackers were directly connected to the group or simply inspired by it. What was the timeline of events? Cambrils, Friday 01:00: A second vehicle attack takes place in the resort south of Barcelona. Police kill five terrorist suspects said to be linked to the Las Ramblas attack. They include Moussa Oukabir, 17, initially thought to be the Las Ramblas attacker. Police later say another man, Younes Abouyaaqoub, is being hunted.